There’s an old story that dogs can smell cancer. At first, it sounds like an urban legend. And while it isn’t untrue—there is evidence dogs can smell cancer—the research isn’t universally accepted, nor has it been shown clinically useful yet. But what if we take the central proposition, that a dog’s nose can detect molecules associated with a disease, refine it, and instead of relying on a hunting dog point, build a machine to do the same thing? Scientists are already on it. The efforts are part of a larger push for earlier diagnosis of debilitating and dangerous diseases, like cancer and Alzheimer’s. Often, by the time symptoms show up, the disease is at an advanced stage and much more difficult to treat. It’s believed that in the earliest stages, when treatment may prove more effective, the body is still full of microscopic molecular clues. Called biomarkers, these molecules associated with diseases may provide enough proof for diagnosis. 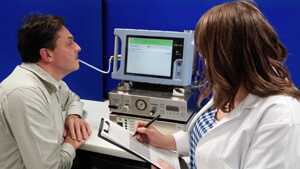 One firm, Owlstone Nanotech Ltd, has developed a kind of “breathalyzer” to detect the biomarkers indicative of lung cancer. The device, called LuCID (lung cancer indicator detection), uses a small chip to analyze a patient’s breath for signature volatile organic compounds (VOCs) associated with the disease. Owlstone cofounder, Billy Boyle, describes LuCID as a “sniffer dog on a mobile phone.” The hope is such compact diagnostic devices will one day make it into doctor’s offices—and maybe even into our homes. LuCID will begin a clinical trial in two UK hospitals this summer with results expected in early 2016. But Owlstone isn’t the only team working on such tech. Another group, out of Chongqing University in China, recently published a paper on their own lung cancer “breathalyzer.” The device, a sensor array on a circular plate paired with a rotary gas chamber, also detects lung cancer associated VOCs at very low concentrations—below 50 parts per billion, they say. To scale, one part per billion is like a pinch of salt in 10 tons of potato chips. The Chinese device has shown great promise in the lab, accurately detecting concentrations of cancer-related biomarkers in a process that takes only 20 minutes. However, they still have to prove the device in wide clinical trials. Yet another group, this one at Siemens, is working to identify as many lung cancer biomarkers in the breath as they can to make diagnosis more reliable and accurate. They’ll also build a cancer detecting breath sensor for future diagnostics. Beyond lung cancer, researchers are looking into ways they might find cancer biomarkers in a drop of blood—this may prove more useful for deadlier and more hidden forms of the disease, like pancreatic cancer. Where is all this going? We aren’t there yet, but the dream would be combine these efforts into a universal test administered by a compact, easy-to-operate device. Perhaps those at greater risk would get more regular tests—and the tests would be far less invasive than current techniques, which often require a tissue sample. Owlstone, the maker of LuCID, says their device might increase early lung cancer diagnosis from 14.5% to 25% by 2020, saving thousands of lives. “If you could change only one thing in the fight against cancer, it would be to detect the disease earlier where existing treatments are already proven to save lives,” says Boyle.